Free Bakery WordPress theme is spectacular in true sense and above all you can use it in an easy manner. It is versatile to the core apart from being highly adaptable making it a spectacular choice for bakeries as well as various other food businesses. It comes with multiple demos apart from predesigned elements as well as components and all these features are perfect in their own when it comes to setting up a bakery or restaurant business website of quality. Besides this, this free theme is known for its mobility as well as retina readiness apart from being cross browser compatible as well as optimised for the top performance. 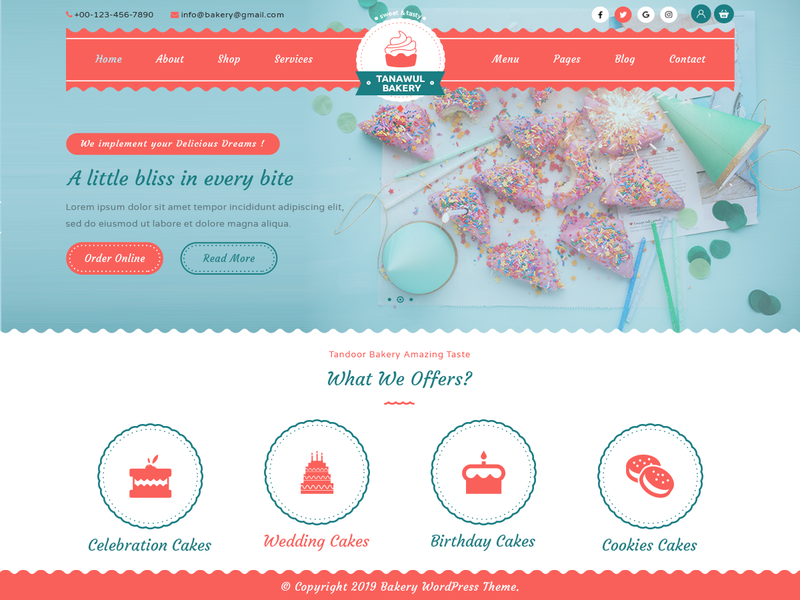 With Free Bakery WordPress Theme, you have the visual online presence and with time, you will win many trustworthy customers. It is an ideal choice because it is qualitative and is practical when it comes to the implementation. With the WooCommerce plugin, you can sell bakery products globally.With the WooCommerce feature accompanied with the Free Bakery WordPress Theme, you have the choice to craft a personal online shop for the sale of fast food and bakery products. Because of hundreds of Google fonts with this free theme, there are typographic variations and irrespective of the selective settings, you will get the results beyond imagination. As owner of website, you have the choice to implement Google Adsense in various page locations. With the help of WordPress live customizer, the user or visitor will have an easy access to endless colour options.